News | The perfect Peking duck: ‘Fatty with a special flavor on the skin’ - Federal Land, Inc. News | The perfect Peking duck: ‘Fatty with a special flavor on the skin’ - Federal Land, Inc.
At No. 8 China House, the recipe for the perfect Peking duck starts with what the duck eats. 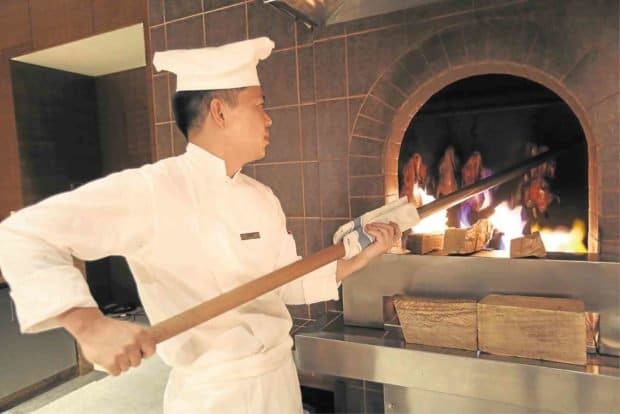 The new Cantonese restaurant at Grand Hyatt Manila is modern, but the cooking technique is traditional. To achieve authenticity, and to make sure that sourcing is sustainable, the Grand Hyatt kitchen crew led by executive chef Mark Hagan visited the supplier’s farm in Laguna. They coordinated with Myles Guillermo, the executive farmer of EJG Mighty Duck Farm. On the farm, the ducks are kept in an area exclusive to Grand Hyatt. Ideal for family celebrations, No. 8 China House seats 186 and has seven VIP rooms. The floor has an open kitchen where diners can watch chefs cook the food. The succulent duck was part of No. 8 China House’s opening ceremony menu. Before transferring to Manila, Ho worked in Grand Hyatt Hong Kong for 17 years. No. 8 China House is at the 5th level of Grand Hyatt Manila, 35th St., Taguig City.